Call detail records in MTS – time service provided by this company. In the invoice prepared at your request, will be provided detailed information on all incoming and outgoing calls, SMS and MMS messages that all transactions on your account specified during the ordering period. In that case, if you used mobile Internet, your traffic will also be reflected in this document. To order an itemized bill, you can contact the company salon MTS, where any operator will do this after presentation of your passport. You can make an order using the web services offered Internet assistant. 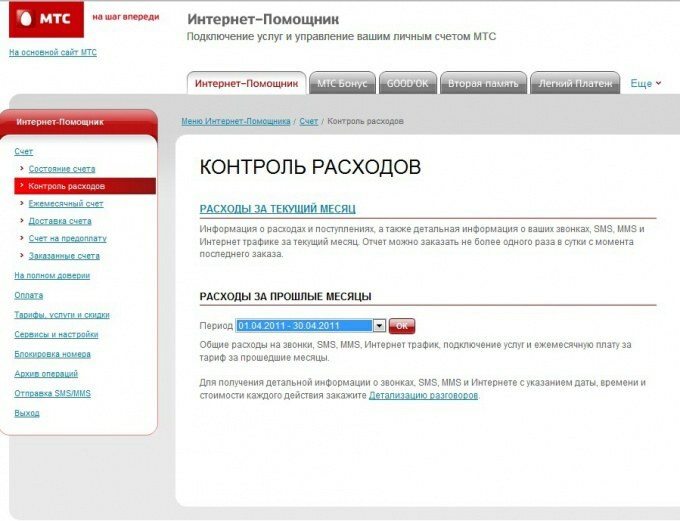 For this you will need to login to the site: http://www.mts.ru/. Then go to your personal account, specifying your mobile phone number and password. In that case, if you first went into the personal account, and you do not have a password, set it by typing on your mobile phone just dial *111*25#. Log in to your account, select from the list provided by the operator services the item "cost Control", and then click the active link "call details". Specify the period for which you want to receive information ( but not later than six months) and select a delivery method – email, putting the address of your electronic mailbox and the format in which you send a document, usually HTML. The service is chargeable and depends on the chosen tariff plan and period you specified when ordering. General information for your period, you can see in the menu "Control costs". The certificate will indicate the amounts you pay to send messages, incoming and outgoing calls – both international and domestic, regular services. Here you can see the balance on the start date and end date of the reporting period. Many people ask how to get call details and account in the Internet, so I suggest to you that this can be done on the official website of MTS with Internet assistant. Just go to the site of MTS of your region, and go to the Internet helper (link in upper right corner), dial *111*23# – Internet assistant (free) *111*25# – set the password.